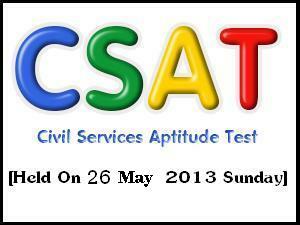 CSAT (Civil Services Aptitude Test) is a test conducted by UPSC (Union Public Service Commission) every year in order to select candidates for the Civil Services Mains Exams. Those who pass the Mains exams and Interview can join the Prestigious Indian Government services like IAS, IPS etc. Online Application Form Available Now! Click on UPSC For More Updates.